EVERY MONDAY YOU WILL GET DOUBLE LOYALTY POINTS! High-quality protein supplement based on a concentrate of whey protein with the addition of natural buttermilk. Thanks to its contents flavor and consistency is truly excellent - just add water to obtain a dense and extremely tasty protein shake. The ideal dietary supplement wo complete protein. LATEST edition of the specialized protein product based on whey protein concentrate (WPC) without admixture of vegetable protein. Supports fat-free muscle growth! Despite the bargain price maintains the high quality of the product. Source wholesome animal protein - making it easy to deliver the right amount of amino acids your body! High quality and good price! The highest quality whey protein concentrate (WPC), which is perfect after a training session and in the sequence of the day as a dietary supplement. With this product than you speed up the process of regeneration of the body after a hard workout. The addition of amino acids beef! 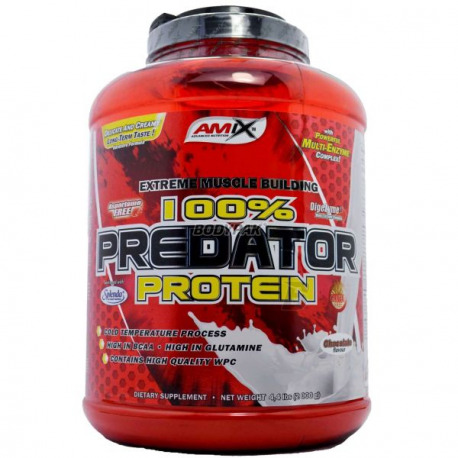 AmixTM PREDATOR Protein is a high quality Whey Protein Concentrate specially designed as a supplement for high protein diet. It contains ultrafiltered low temperature processed and instantized Whey Protein Concentrate (WPC) as well as a high content of amino acids derived from beef protein. The product is sweetened with Splenda® sucralose and therefore i tis completely Aspartame FREE! For the best utilization of all important nutrients we have added a powerful and patented digestive multi-enzyme comples DigeZyme®. 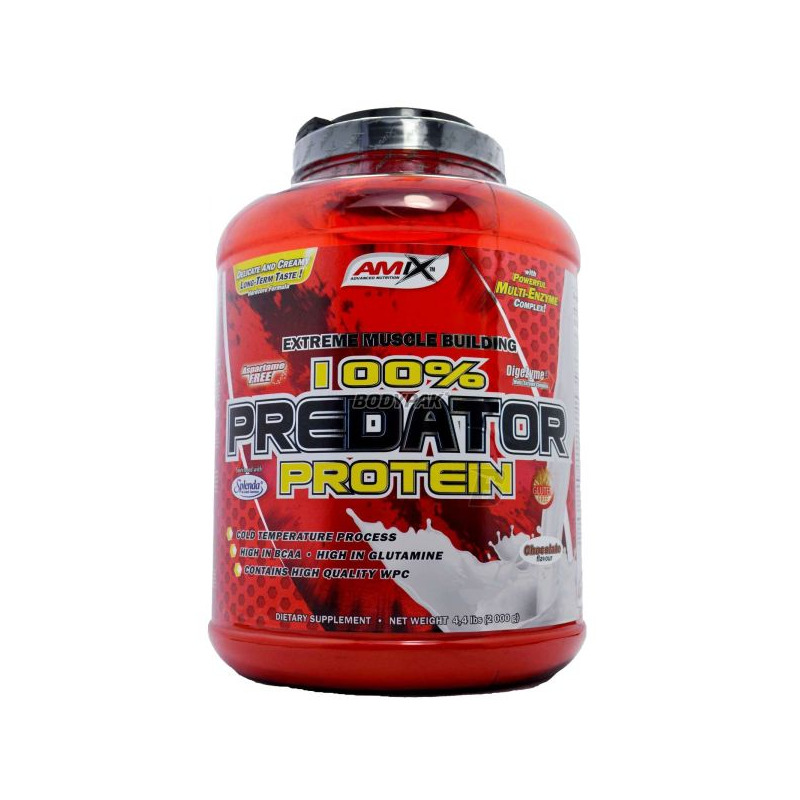 Ingredients: AmixTM Predator Premix (ultrafiltrated low temperature instanizowany whey protein concentrate amino acid protein derived bovine), cocoa powder (only chocolate flavor), maltodextrin, stabilizers: xanthan gum and guar gum, < b> soy lecithin , natural and nature identical flavors, sweeteners: sucralose Splenda and acesulfame K, dye (banana flavor - curcumin, strawberry flavor and forest fruit - extract zz red beet, taste apple cinnamon - tartrazine and paten blue V), patented complex Digezyme enzymes (amylase, lipase, lactase, cellulase, natural protease derived from bacteria). Wholesome source of protein in powder form. Sensational flavor and solubility of each serving will surely appeal to you! Ideally suited to a day, and immediately after training, ensures rapid supply muscles with high-quality amino acids that build your muscles! The best protein for use after training. Dramatically improves the speed of growth of muscle tissue. Reach for the supplement if you appreciate quality, perfect solubility and taste delicious protein shake. High-quality organic protein derived from whey protein created from the milk of cows with free range. The original flavor comes from the addition of cocoa. An ideal choice for those seeking support for their diet. Good solubility! The highest quality, lactose-free, pure whey protein isolate (WPI) supplemented with a complex of vitamins and minerals ensuring the normal course of metabolic processes during vigorous physical exercise and increased intake of proteins. Top-quality protein supplement, which was established based on a concentrate and whey protein isolate! High biological value makes it an ideal nutrient for athletes! Interesting flavors and no problem of solubility! Comprehensive bid high protein-based sources of protein with different absorption time! Check both during the day and at bedtime in order to reduce catabolic night. It tastes good and easily dissolves. High-protein nutrient, which allows anyone to finish your day in a very tasty and full blown way! Ideal shake, which can also be part of other dishes. Proteins derived from four high-quality sources! Universal high-protein nutrient where you will find the composition of the highest quality isolate, concentrate and hydrolyzed whey proteins (WPI, WPC, WPH). You can enjoy it during the day and after exercise. Interesting flavors and good solubility!